The Solar Plexus Chakra is our centre of power. It is the seat of our ego, but also the place of the will. Many of us struggle with some extreme regarding this Chakra. We may feel confident or timid, aggressive or passive, superior or inferior, driven or listless, worthy or unworthy, powerful or weak. 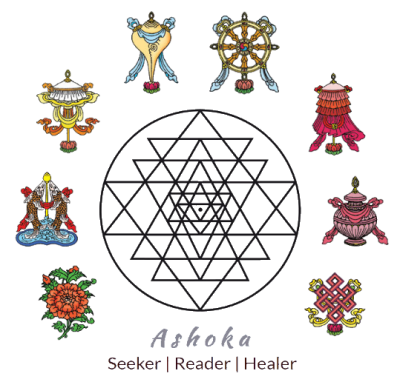 We want to achieve a good balance… a healthy stance with our Solar Plexus Chakra. This is our inner sun – the place where we shine our light in the world… and tell the world who we really are. … this ceremony seeks to address that. Come with an open and honest state of mind with regard to all your issues of power. Come join Ashoka, Jane, and Yuanhui as they passionately share how dōTERRA Essential Oils can help you achieve abundance in all areas of your life – financially, psychologically, and spiritually! Through the framework of Maslow’s Hierachy of Needs, the trio will share how specific dōTERRA Essential Oils support your basic, psychological and self-fulfillment needs, addressing the multi-layered concerns that lay between you and your financial abundance. It’s a casual, candid affair – so come on down and join us for an evening of learning! Dear Malaysian friends! ​I’m happy to announce my debut in Malaysia at the bodymindsoul Carnival "Harmony" at IOI Mall Puchong, organised by bodymindsoul Magazine! I’m excited to bring my Healing Services and Spiritual Teachings to cater to a growing Holistic/Spiritual community in Malaysia! ​Come visit me at my booth as I offer my 15min Consultations using a combination of Tarot & Oracle Cards, Akashic Records, and Chakra Balancing & Healing! If you prefer to stick to one modality, just say the word! I will also be leading “A Chakra Healing Meditation” at the Carnival on Saturday, 30 Mar 2019, from 2pm – 2:30pm. 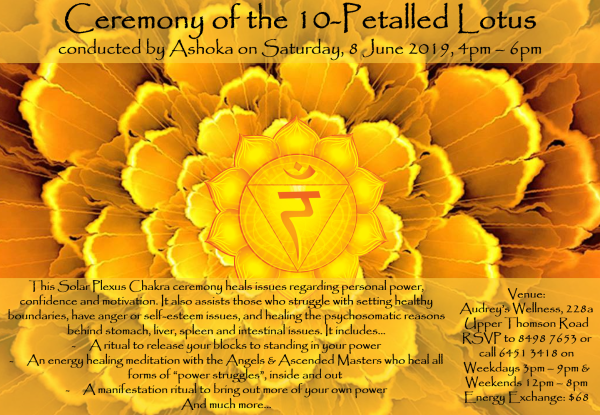 This will be an immersive and eclectic experience as I shed light on the common and not-so-common Chakra associations, and guide you on a meditation to balance, align and heal your Chakras for greater Harmony in your life! In the 2 days following the Carnival, I will be offering Private Consultations and Workshops in Puchong! There are limited slots for these, so please book early! The exact address will be disclosed upon registration. This is a Sacral Chakra ceremony for anyone in a creative role – artists, musicians, writers & performers. It also helps those who need to work on their sacral area – whether it’s dealing with emotions, embracing pleasure, or healing the psychosomatic issues regarding the creative centre. 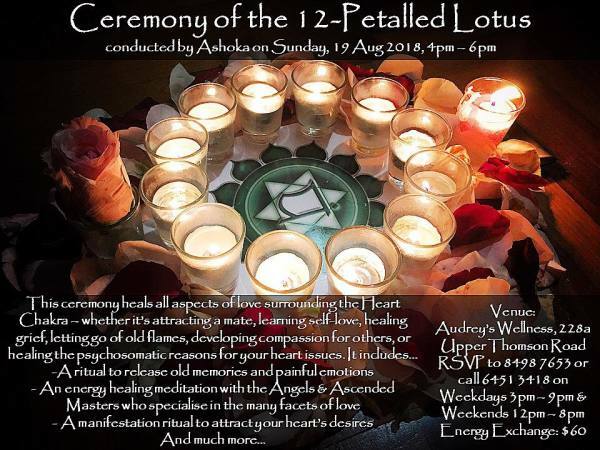 This ceremony heals all aspects of love surrounding the Heart Chakra – whether it’s attracting a mate, learning self-love, healing grief, letting go of old flames, developing compassion for others, or healing the psychosomatic reasons for your heart issues. Do kindly understand that due to logistics, full payment has to be made to secure your slot. Limited sessions – so hurry!